The 1903 1904 Ford Model A and AC - the first Ford cars. Homepage. 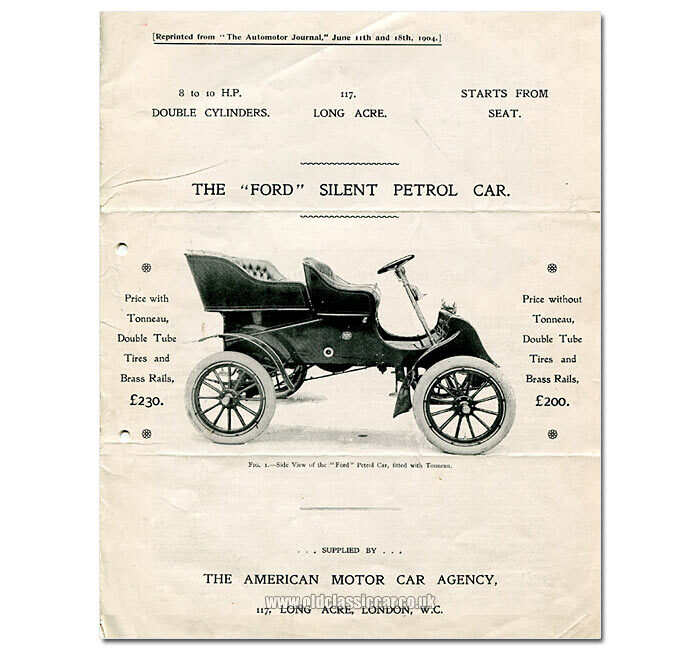 This page: The first Ford car, the 1903/1904 Ford Model A (8hp) and AC (10hp). The Ford Model A of 1903. The Model A was the first Ford car to go on sale following the creation of the Ford Motor Company of Detroit, described in this contemporary sales leaflet as a "newcomer" to the market, comparing the rise of car production in Michigan with that already established in Coventry, England. Production commenced in 1903. This original leaflet lifts most of its report on the new car from an article previously run in motoring magazine "The Automotor Journal", on June 11th and 18th 1904. This review was issued by sole importer for the car - The American Motor Car Agency, of 117 Long Acre, London, England. The cover features a side view of the Model A, in Tonneau guise with its extra rear seating arrangement. 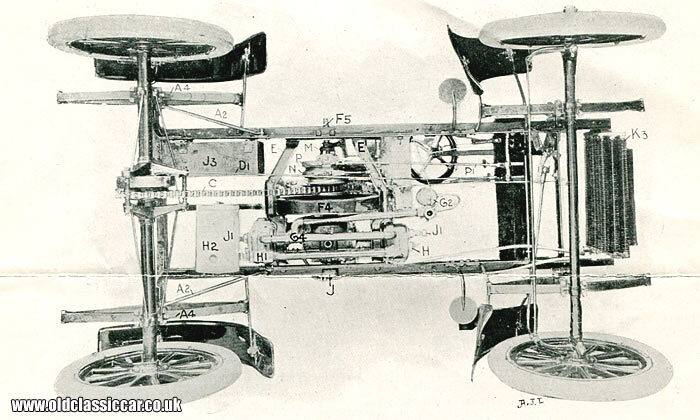 Price for the car in this configuration, with Double Tube Tires [sic] and Brass Rails, was £230. Buy it without these accoutrements, therefore as a two-seater, and the price fell by £30 to £200. There is reference to both 8hp and 10hp versions being on offer - initially the car was powered just by the 8hp unit, but in 1904 some Model As were sold with the uprated engine of the more modern Model C, the revised model referred to as the AC and rated at 10hp. The slogan for the Model A is: The "Ford" Silent Petrol Car. Excerpts from the Ford's sales leaflet. While it'd take many pages to describe in full the magazine's review of the car and its technical specification, I'll highlight a few paragraphs of interest, starting with the introduction to the review, which in effect acts as an introduction to Ford itself, given that the majority of readers would never have heard of Henry's young company in Detroit. "The success that has attended the introduction of the well-known types of light American cars to this country has induced yet another manufacturing house in the States to appoint agents over here for bringing their handy little vehicles before the notice of the British public. The newcomer is the production of the Ford Motor Company of Detroit, a city in the State of Michigan which has rapidly grown of late to be the "Coventry" of America, and where there are now quite a considerable number of huge factories busily engaged in the manufacture of motor-cars; and this vehicle is being sold in Great Britain by the American Motor Car Agency, of 117 Long Acre, WC." "The Ford car is somewhat similar in the general arrangement of its parts, and in the type of transmission gear that is employed, to the other American petrol cars which are already so well known and appreciated over here. It has, however, many interesting and distinctive features, and the engine is more powerful than on most of the other cars of a similar kind. To begin with, the engine has two horizontal cylinders instead of one, and they are placed on opposite sides of the crank-chamber so as to give an impulse at a similar time during each revolution, and a very satisfactory mechanical balance of the moving parts." "The two forwards speeds and the "reverse" are provided by a combined epicyclic gear and clutch mechanism that is mounted on the crank-shaft, and the end of the crank-shaft - outside the gear - is supported by a third bearing which is rendered rigid with the engine by an independent framework fixed to the chassis frame. An interesting feature of the epicyclic gear is that no internally-toothed gear-wheels are employed in it. Another striking characteristic of the chassis is its simplicity of appearance, this effect being partly produced by the compact arrangement of the engine with the gear and the supply tanks as a separately detachable unit, which is centrally arranged in the car." "The method of suspension adopted consists of the employment of double elliptic springs, at each side, above both axles. 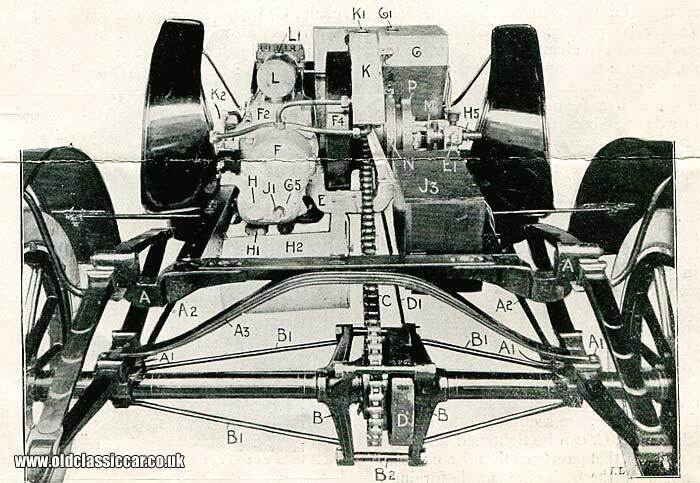 The rear springs are pivotally connected to the frame, and are so attached to the axle that the latter can be moved bodily forward or backward beneath them when it is necessary to adjust the driving chain. These rear springs, too, are reinforced by an inverted transverse spring which acts as a check-spring, and has its ends resting upon the centres of the side-springs. Steering is effected by a wheel mounted upon an inclined pillar, and there is a direct system of levers and rods to connect it with the steering heads." "The standard bodies on these vehicles are of the detachable tonneau type which has now become so popular in America, although a Ford car is also supplied as a two-seater for those who do not require the additional accommodation furnished by the tonneau." "Ample power is provided for enabling the car to travel at a high average speed even when carrying its full complement of passengers, and, like most of the light cars that are built in the States, the vehicle runs very comfortably even on very rough roads, and is normally remarkably silent. The actual power available from the comparatively slow-speed engine is about 10 bhp. The engine is primarily controlled by a foot-pedal acting upon a throttle valve, although the time of ignition is variable by a hand-lever on the steering pillar. Like other cars of its type it is particularly easy to drive, and is very handy to manage even in the thickest of traffic." The article then goes into great detail over several more pages regarding the precise construction of the car, and the highlights of its design. On the final page there are some instructions on how the budding motorist might go about persuading this horse-less carriage to actually move. Starting, and driving the Ford. "The control of a "Ford" car is very simple, the various levers and pedals for which are clearly shown. To the right of the driver's seat is the change-speed lever, which lies in a central position when the car is at rest. To start the car - by introducing the low-speed gear - this lever is pressed rearwardly, and, if moved as far as it will go, it will remain there. When starting, however, it is only necessary to press it back sufficiently to get under way, and it can then be moved forwards to bring the top-speed into play. When running normally it may be left in its forward position, or, when travelling in traffic, the clutch can be allowed to slip to a certain extent by exerting only the requisite pressure on the lever." 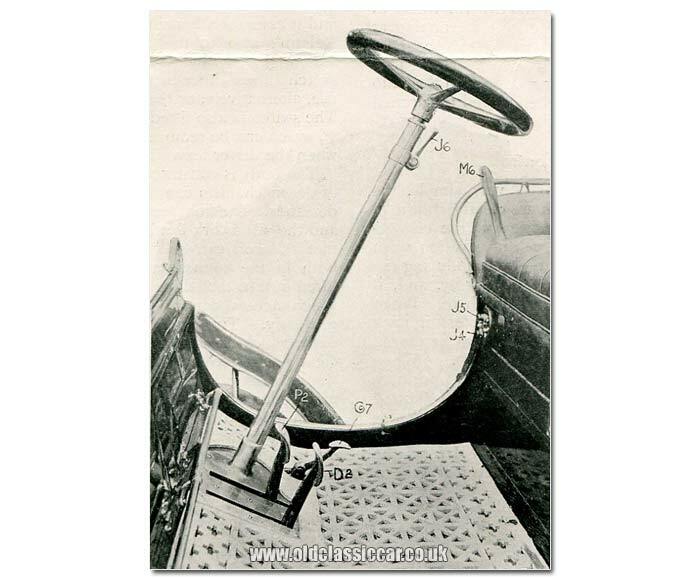 "The foot pedal which lies just to the left of the steering pillar, is that by which the "reverse" gear is introduced, and this, of course, is only used when the hand-lever is in its neutral position. To the left of this pedal is the brake pedal which actuates the internal expanding brake, on the back axle." "The third, and smaller, pedal is operated by the right foot, and it controls the throttle valve. The speed of the car on the road is therefore controlled for the most parts by means of it, the speed increasing as it is depressed. When completely released, the engine can only obtain sufficient mixture to run quite slowly when the car is at rest." "The hand lever on the steering pillar is that which regulates the time of ignition, and should, in consequence, be moved from the vertical position downwardly, as the speed of the engine is allowed to increase. As shown, the ignition is "retarded" to the extent necessary for starting, and it resumes a horizontal position for full "advance". Relating also to the ignition system, is the two-way switch which is fitted just beneath the seat. This switch allows either battery of cells to be brought into use, alternatively, or the current to be entirely cut off. The switch is also fitted with a detachable contact plug, which can be removed to prevent the car being started when the driver leaves it." "The body is constructed so that all the various parts of the mechanism can be readily got at when occasion demands. The front seat can be lifted up for replenishing, and the woodwork forming the front of it is hinged so that the coil can be exposed to view. The floor, too, both in the tonneau and in front of the driver, can be lifted out, so that there is no part of the mechanism to which access cannot be obtained quickly and conveniently. The front portion of the body forms a low dash, which is so constructed as to constitute a sufficiently large toolbox, in which even such comparatively large accessories as jacks and tyre pumps can be accommodated. The petrol tank holds about 4.5 gallons, which is found to be sufficient for running a distance of about 135 miles. As we have already said, the 4-seated car is made in such a way that the tonneau is detachable; when this is removed, a sloping back is substituted." While the tonneau version was listed in Great Britain at £230, the equivalent car in the USA retailed for $850. 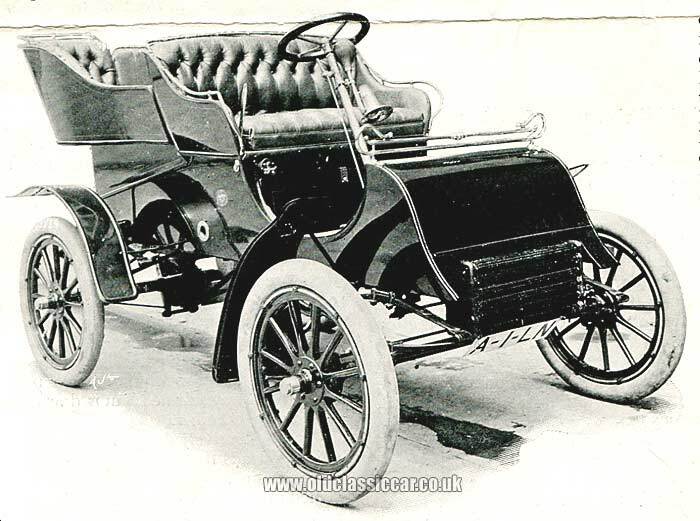 The Model A was sold in 1903 and - when it was joined by the 10 hp AC - in 1904. In this year the larger Model B also entered the sales catalogue, while the Model C took over from the A/AC later in 1904. 800 examples of the C were built before it gave way to the Model F in 1905.